John Howard Williams was born on 3 July 1894 in Dallas County, Texas. Daniel Paul Williams and Emma Julia Bozeman appeared in the US federal census of 15 April 1910 in Dallas, Dallas County, Texas. Other members of the household included John Howard Williams. Also in the household were children Annie Lee (age 19), Luther B. (17), Tom (14), Earl (9), Mary (6), Maurice (4), Grace (2) and Reeves (5 months). John Howard Williams registered for the draft on 5 June 1917 in Dallas County, Texas, while single and living at 2809 Birmingham in Dallas, and employed as a clergyman at Cole Avenue Baptist Church. He served as an Army chaplain during World War I. He married Floy Ettys Kelly, daughter of James W. Kelly and Mattie Slaughter, in June 1920. John Howard Williams and Floy Ettys Kelly appeared in the US federal census of 1 April 1930 in Corsicana, Navarro County, Texas, at 116 North 15th Street. Other members of the household included John Howard Williams Jr. He was a Baptist minister, according to the 1930 census. John Howard Williams and Floy Ettys Kelly appeared in the US federal census of 1 April 1940 in Amarillo, Potter County, Texas, at 2010 Polk Street. Other members of the household included John Howard Williams Jr. In 1935 the family was living in Dallas. He was a minister, according to the 1940 census. The following appeared on 28 March 1953 in The Dallas Morning News: Joseph T. Mason, son of Mr. and Mrs. Cary Mason, 5810 Goodwin, will be ordained as a minister at 2 p.m. Saturday in the Bethlehem Baptist Church at Porter Springs, Houston County. Dr. J. Howard Williams, Dallas, executive secretary for the Baptist General Convention of Texas, and Dr. George J. Mason, former executive secretary here for the Baptist Foundation of Texas, will take part in the ordination ceremonies. Dr. Williams is the father-in-law and Dr. Mason is an uncle of the candidate. Joseph T. Mason is a student at Southwestern Baptist Theological Seminary in Fort Worth. The following appeared on 5 June 1953 in The Dallas Morning News: Dr. J. Howard Williams, top executive for more than a million Texas Baptists in 3,000 churches, on Aug. 1 will become head of the largest theological institution in the world. He leaves his post of executive secretary of the Baptist General Convention of Texas and will become president of Southwestern Theological Seminary in Fort Worth. The seminary has 2,160 students receiving training as ministers, missionaries, music workers and religious educators. Dr. Williams was general convention secretary since 1946. Before that he was pastor of Baptist churches in Dallas, Sulphur Springs, Amarillo, Corsicana and Oklahoma City, Okla. He was born in Dallas at 800 Second Avenue, west of the old Fair Grounds, in 1894. He attended what is now the Thomas C. Hassell School at Second Avenue and Peabody, and later the Hardin School for Boys. On his graduation from Baylor University in 1918, Dr. Williams became an Army chaplain and served in France as a first lieutenant. After military service, he entered Southwestern Theological Seminary from which he was graduated in 1922 with a Master of Theology degree. Then followed additional graduate work at Southern Seminary in Louisville, Ky., and in 1932, he received a Doctor of Divinity degree from Baylor University. The Baptist leader decided to become a preacher while in his early teens. He often attended downtown mission services during his lunch hour from his Sanger Bros. shoe department job. When sixteen, while riding his bicycle on Forest Avenue sidewalks to a preaching engagement in Reinhardt, he was arrested. Charged with violating a city ordinance--riding a bicycle on city sidewalks--he joined prisoners in the city jail. Until a friend bailed him out later in the day young Williams spent his time persuading other prisoners they should mend their ways. Dr. Williams has twice held the position of executive secretary of the general convention, a job which combines administration, promotion and preaching. When first named in 1931, he was the youngest Baptist leader ever to hold the office. In 1936 he resigned to accept the pastorate of the First Baptist Church of Amarillo. While there his Sunday school attendance grew from 1,050 each Sunday to more than 2,000, and the annual budget increased from $35,000 to $100,000. After becoming pastor of the First Baptist Church in Oklahoma City in 1940, Dr. Williams in five years raised the church budget from $65,000 to $235,000, and added 3,100 members to the church in the process. As TBGC executive secretary, Dr. Williams co-ordinates religious activities for 3,411 churches with a total membership of 1,262,451. Baptist headquarters in Dallas, which he personally directs, is divided into thirteen departments which assist churches and Baptist institutions partipating in the State and Southern Baptist Co-operative Program. The Baptists of Texas own and operate seven senior colleges and universities, one junior college, an academy at San Marcos, six hospitals and four children's homes. The total evaluation of property of Texas Baptists exceeds $250,000,000. They own their own state foundation and publish a 24-page weekly magazine with a circulation of 269,000. Dr. Williams and his wife, the former Miss Floy Kelly of Fort Worth, live at 5647 Swiss Avenue. They are the parents of five children, Mrs. Martha Genne Sandford of Oklahoma City; Mrs. Carolyn Lee Mason, whose husband is pastor of the Porter Springs, Houston County, Baptist Church; J. Howard Williams, Jr., Houston; Kelly Dan Williams, University of Texas law student, and Miss Floy Kate Williams, Baylor University student. At the time of his death John Howard Williams was living in Fort Worth, Tarrant County, Texas, at 4441 Stanley Avenue and was serving as president of Southwestern Baptist Seminary. John Howard Williams died on 20 April 1958 at age 63 in Fort Worth, Tarrant County, Texas, at Harris Hospital. His wife Floy Ettys Kelly became a widow at his death. He was interred at Laurel Land Cemetery, Fort Worth, Tarrant County, Texas. The breadth of a man’s time does not always directly correspond with the impact of his influence. Although the tenure of his presidency is the shortest, J. Howard Williams exemplified the heart and passion of the spiritual giants who had preceded him and issued a progressive plan for the future of the institution. Keen administrative abilities combined with a zeal for missions and a heart for fellowship helped him accomplish an extraordinary amount of work in his five years as president of Southwestern Seminary. John Howard Williams was born to devout Christian parents near Dallas on July 3, 1894. The third of 12 children, he was forced to grow up quickly, dropping out of school in the fourth grade to earn money for the family. After taking out money to tithe and pay for transportation to and from work, he would give the rest of the money to his mother to meet the family’s needs. That same year, at a revival meeting led by George W. Truett, Williams placed his faith in Jesus Christ. His first lesson in missions came soon after, when his father challenged him and his brother to see how much cotton they could pick in one day so that they could give the money they earned toward mission work. Little did his father know the impact that day would have on Williams’ dedication to missions and stewardship. Williams felt called to preach at age 15, and the church graciously provided opportunities for him to serve. By 1913, he reportedly had preached in nearly every church in the local Baptist association. Wanting to return to his education, Williams entered ninth grade at age 18. He then attended Baylor, where he earned a bachelor’s degree in 1918. During his final year in college, he was burdened by World War I; after graduation, he enlisted as a chaplain in the Army. Upon returning to the states, Williams married Floy Kelly on June 23, 1920, and became a pastor. He also attended Southwestern Baptist Theological Seminary, where he received his master’s degree in theology under L. R. Scarborough’s administration in 1922. He did further graduate work at the Southern Baptist Theological Seminary and received an honorary doctorate from Baylor University in 1932. Throughout his life, Williams served as pastor of seven churches, including some of the strongest in the Southern Baptist Convention (SBC). In each church, he organized denominational programs and championed evangelism, missions, and stewardship. He served as a trustee of several institutions and helped lead many successful financial campaigns. Williams became a denominational leader, serving as the executive secretary of the Baptist General Convention of Texas (BGCT) for 13 years and president of the BGCT from 1938 to 1939. While serving the BGCT, he spearheaded missionary, educational, and benevolence programs totaling $40 million. In each place he served, he was recognized for his brilliant administrative skills, vision, and wholehearted dedication to the Gospel. In 1953, Williams was elected the fourth president of Southwestern Baptist Theological Seminary. He enthusiastically presented a grand vision to raise $10 million for the seminary, with $5 million going toward endowment. The other half of the money would be used to enlarge the faculty, complete renovations to existing buildings, and construct needed facilities. Although he would not see all of these projects completed before his death, he set the wheels in motion for his successors to see the seminary reach new heights. A winsome spirit quickly earned the respect and friendship of the faculty. Williams believed the primary function of the administration was “to enable the faculty to deliver its fullest potential impact on the student body.” He increased the faculty by 37 professors, which dramatically decreased the student-to-teacher ratio. Additionally, he brought a new emphasis on rural pastor training by employing a professor to offer courses in the department of pastoral ministry. 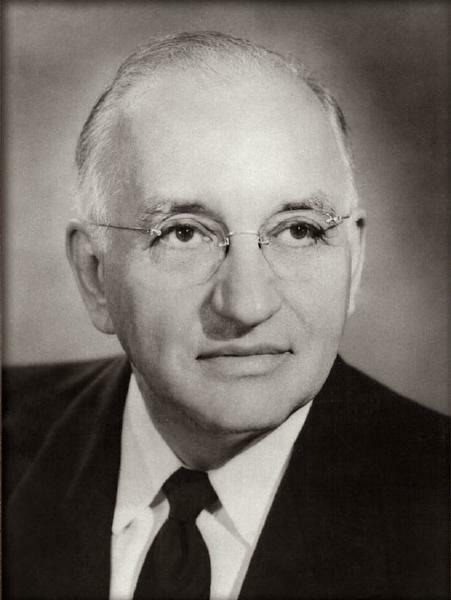 After suffering a severe heart attack, Williams’ presidency was cut short by his sudden death on April 20, 1958. In the middle of celebrating its 50th year, which he helped plan, the seminary put festivities on hold to mourn the loss of its beloved leader and friend. The Sunday before J. Howard Williams died was Easter Sunday. He preached on the resurrection of Christ, as he had so many times before. After the service, he began talking to two teenagers, and after an extended discussion, each of them made professions of faith. His final days demonstrated his faithfulness to his Master’s work until the end.